Home » Uncategorized » Sound Masking! Work space and public areas in your facility are too loud. Sensitive information, private conversations are being heard by everyone. It’s so loud employees and visitors complain they can’t hear, can’t concentrate. Sound masking is the addition of an unobtrusive background sound that reduces the intelligibility of human speech and distractions. What is the benefit of Cambridge Sound Masking Technology? Sound masking increases speech privacy from 35% to 90%. Participants improve their recollection of words and numbers nearly 10%. The results lead to greater productivity and increased privacy and comfort. What are the Advantages of Cambridge Sound Masking Technology? Precise control of where the sound is emitted. Uniform coverage that is unaffected by ceiling design. Emitters can be installed in any work space, no matter what type of ceiling. Emitters can be moved and reconfigured. Systems integrate paging and music functionality. Cambridge Quiet Technology is environmentally friendly sound masking system. It’s noisy in your lobby with large reflective surfaces, windows, wooden artistic dividers, exposed ventilation and beams. The high open ceilings and short glass workstation barriers make it worse. Adjacent to the workstations are a variety of conference rooms and private offices with frosted glass walls and smooth concrete flooring. All aesthetically pleasing, but do nothing to block sound from travelling throughout the open office layout. An Operations Center, 1,800 square feet of open office workstations and five private offices. The area features twelve-foot ceilings with eight-foot tall wooden walls dividing the private offices from the open office workstations. There is a four-foot gap between the office wall and the ceiling, allowing for sound to carry from the private offices to adjoining spaces. The internal walls also include large glass windows to allow for external light to reach the open offices. Conversations and noise spread easily throughout the space, causing severe distractions for the workers. You just merged over 200 employees into a 38,000 sq-ft. office space. The interior design is visually appealing but very detrimental to workplace acoustics. Sound reflecting windows, walls and skylights, all reflect sound and noise. Employees in an 8,300 sq-f t. open office space complain about hearing confidential information coming from offices. They have trouble concentrating and are distracted by conversations in the neighboring workstation. Offices only 15 feet away from consultation windows, where patrons discuss personal information, can be overheard by others. Cambridge Sound Masking Systems solves acoustic challenges. Cambridge Sound Masking Systems cover up distracting conversations and other workplace sounds. Cambridge Sound System can be custom configured for open and private areas. Cambridge Sound Masking Systems improve privacy. Cambridge Sound Masking Systems can be expanded when required. Cambridge Sound Masking Systems can double for office paging or background music. The Qt 100 is ideal for single zone spaces of up to 12,000 square feet (1,115 m2). 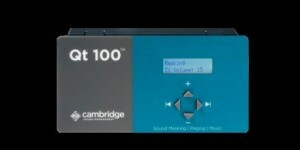 The Qt 100 is easily controlled from the module’s front panel or Bluetooth connected iOS device, making volume adjustments quick and easy. The Qt 200 is ideal for medium-sized, single or two-zone spaces of up to 24,000 square feet (2,230 m2). This system is capable of covering large spaces on each floor as well as meeting the needs of businesses that require separate zones for private and open offices. The Qt 200 is an integrated solution offering sound masking along with paging or music via an auxiliary audio input. The Qt 600 is ideal for medium to large multi-zone spaces of up to 72,000 square feet (6,689 m2). This system is capable of covering up to 6 diverse areas in buildings needing improved speech privacy. This robust and feature-rich system is easy to control and maintain. Users can adjust system settings via the easy-interface front panel, and can also set up error reporting and establish time dependent masking levels via their PC, Mac or tablet device using the intuitive Qt™ Monitoring and Control Software. Additionally, the Qt 600 is an integrated solution offering sound masking along with paging and music via the two auxiliary audio inputs.